BlackBerry is on recovery mode since the launch of the BlackBerry 10 OS and the launch of new devices like the BlackBerry Z10, BlackBerry Q10 and BlackBerry Q5. BlackBerry 10 turned out to be good and the devices equally good, at least according to most reviews. I had the chance to use and review two of these new devices, namely, the BlackBerry Z10 and BlackBerry Q10. The two are both excellent devices, but I was more interested on the Q10 as I have always been attracted to QWERTY phones. Read the rest of the review to know how the BlackBerry Q10 fared. BlackBerry single-handedly popularized the QWERTY keyboard platform. Back when BlackBerries were the hot properties in town, other brands came out with similar-looking devices. 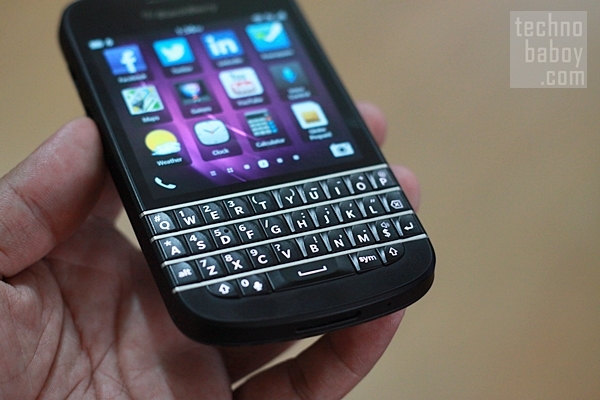 If you have been a fan of the QWERTY phones from BlackBerry, you’ll definitely lust over the BlackBerry Q10. It is a drool-worthy device, that is, if QWERTY-toting, business setting-proper phones are your thing. It is obvious that BlackBerry gathered all the tricks that made it popular, improved on them, and put them on the BlackBerry Q10. 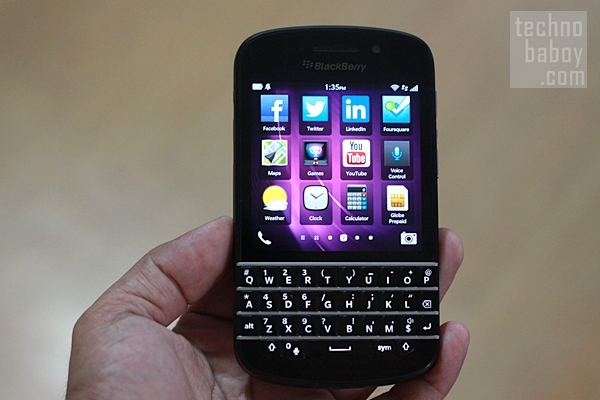 The BlackBerry Q10 features a 3.1-inch Super AMOLED touch display and a redesigned and re-engineered QWERTY keyboard. It has rounded corners and curved edges, making it really nice to hold. The colors are mainly black and the back cover has a Kevlar-like finish. There are a few silver accents that make the phone stand out like the silver strips in between the keys and a silvers strip at the back cover just below the camera. 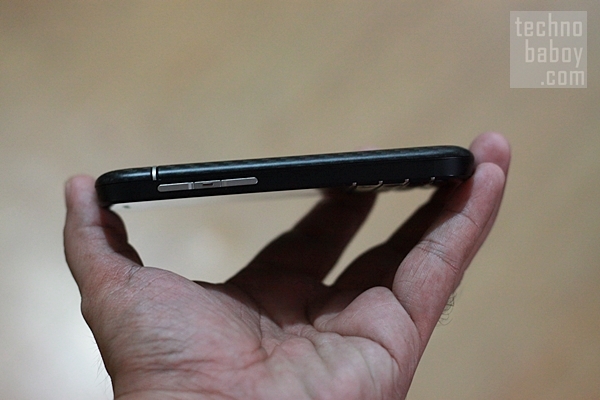 For buttons and ports, the BlackBerry Q10’s power button is located on top, beside which is a 3.5mm headphone jack. On the right side is the volume rocker and in between is a voice control shortcut button. The phone is light and every detail seems to be well thought out. Needless to say, if you are in a business setting, the BlackBerry Q10 will enhance your image. That’s how good-looking the phone is. 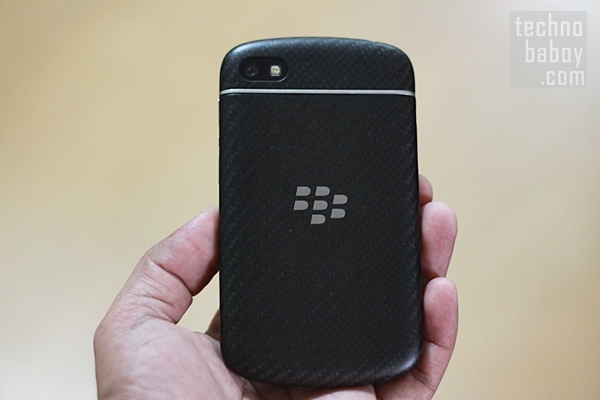 The BlackBerry Q10 is powered by a 1.5GHz dual-core processor, 2GB of RAM and has NFC and LTE connectivity. Its 3.1-inch touch screen has a 720×720 resolution at 330ppi, making it HD in quality. It has 16GB of internal storage, expandable up to 64GB, an 8-megapixel rear facing autofocus camera with flash and a front facing camera. All in all, this is a compelling set of hardware specs, but most people will probably want quad-core CPU for the hefty price tag the BlackBerry Q10 is demanding. Based on my use of the device, a quad-core CPU is not necessary as the OS ran smoothly on the 1.5GHz dual-core processor. The display on the BlackBerry Q10 really stands out. It is crisp and bright, colors pop and the clarity is simply astounding. However good the hardware of the BlackBerry Q10 is, it is ultimately judged by how it is in actual use, and to do this you also have to judge how good the BlackBerry 10 OS is. This OS is relatively new and it is different from the previous operating systems of BlackBerry. BlackBerry 10 is optimized for touch operation and follows the elements previously implemented on more established operating systems like Android and iOS. However, BlackBerry 10 OS is a distinct OS and has unique elements that make it stand out from the other platforms. It operates on gestures and has a very low learning curve. A few minutes of use is enough to get you familiarized with the main gestures and the rather simple navigation. Opening the screen requires an upwards swipe. BlackBerry 10 OS has no home button so in that sense, it’s different from Android and iOS, or even Windows Phone. The main screen hosts your app icons, with home screens arranged horizontally. Swiping to the right reveals your running apps and this is how multi-tasking works on BlackBerry 10. You can tap on the running ups to bring them to the front or close them permanently by tapping the “X” button on each app. Swiping to the right from the running apps screen reveals the main panel that hosts main features BlackBerry Hub, Notifications, BBM, Text Messages, Calls and others. Swiping from the top down on the other hand reveals shortcuts to main settings. Every app has its own set of menu so sometimes you need to check what the buttons on each app does. BlackBerry 10 OS uses a bit of animation everytime you start an app. On Windows Phone, it’s a flipping motion that slowly reveals the app and the effect is rather natural and elegant. On the BlackBerry 10 OS, everytime you start an app, it brings you to the running apps screen before the app finally opens. This, in my opinion, is not as natural as the animation on Windows Phone and it somehow creates an extra stop that has no real use to users. And most of the time, this animation is not smooth. Another thing that should be mentioned about BlackBerry 10 OS is the limited number of apps compared to Android and iOS. Most of the important apps are available however and as long as BlackBerry World has the apps that you really need, you’ll be fine. Other than these quibbles, the OS is good and it’s coherent overall. I also like the OS aesthetically. Icons look good and the overall design really appeals to the senses. The BlackBerry Q10 performs well. Apps load fast and multitasking is also executed well. There are really no major issues in terms of performance. The keyboard is as advertised – it’s wider and keys are bigger, resulting in a better typing experience. That said, tying requires a two-handed operation. It’s just impossible to use the keyboard using one hand. But if you’re a BlackBerry user, you already know this. Battery life on the BlackBerry Q10 is satisfactory. The device was able to last more than 12 hours on a single charge. My tests include the occasional use of Wi-Fi and loading the usual apps. The BlackBerry Q10 is good. It’s in fact better than the previous QWERTY phones from BlackBerry. With the new BlackBerry 10 OS and the phone’s premium design and finish, the handset is a must-have if you’re in a business setting. What I like best about the BlackBerry Q10 are the beautiful display and the excellent keyboard. If you want a phone that combines touch OS and a physical keyboard, the BlackBerry Q10 is probably the best handset to get. However, there are things that you should consider if you want to get the BlackBerry Q10, foremost of which is the price. A prepaid variant retails for Php31,990 and for most, this is quite hefty. Do the features and specs justify the price? This is something relative and only your personal preferences and needs will dictate whether such price is reasonable. Most Filipinos will say it’s not, but business executives and those who really need a QWERTY will probably say it is. The collection of apps on the BlackBerry 10 OS is also not as robust as it is on iOS and Android, so you need to think of this as well.